AEEE 2019: The Amrita Entrance Examination for Engineering is among top-rated examination for pursuing undergraduate engineering. The Engineering Entrance Test is for getting admissions in Amrita Vishwa Vidyapeetham being conducted at national level. Latest Update: Today is the last date for AEEE 2019 Registration for PPT Mode of Exam. Latest Update: AEEE 2019 Slot booking Process has been started from 12 April!! Latest Update: AEEE 2019 Online Application Submission Started from !! Check the Procedure below. Latest Update: AEEE 2019 Schedule Announced!! Check the table Below. Amrita Vishwa Vidyapeetham is among the top-rated universities, located in Tamil Nadu. The rank of the university according to the National Institutional Ranking Framework (NIRF) is 8th best, stating enough proof of better education. 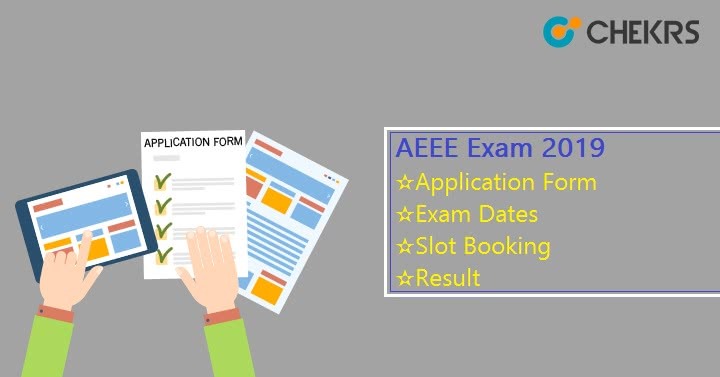 If you are interested to apprehend more AEEE Exam Details, read out complete article containing more details such as Eligibility Criteria, AEEE Registration, Application forms, Exam dates and more in the queue of the admission process. As the AEEE is the test for getting admission to B.Tech course, willing candidates are asked to go for the registration process only if they fulfill AEEE Exam Eligibility. The exam can also be given by students who have appeared in the 12th class examination same year. Age: Applicants whose age falls after 1st July 1997 i.e. not more than 21years. Education: The willing contender should have passed 10+2 in Physics, Chemistry, and Mathematics with a minimum aggregate of 60% marks. Subjects Qualification: The marks in individual subjects of Physics, Chemistry, and Mathematics should not be less than 55%. Admission in the university is a big concern thus it is important for the aspirants to follow the dates very well to avoid any delay. From it will be easy for all interested students to stay updated with the AEEE Exam 2019 Dates. The registrations for appearing in the exam are done through filling application forms made available on the university website only. In order to submit the application, students will have to follow online procedure for better convenience. However, interested students can also submit their AEEE Application Form 2019 in easy steps, through steps guided here. On the home page find the option of AEEE from the left pane. Go to the option of ‘How to Apply’ and click on the link. Follow the link of the application form and proceed further by opening the link. Step by step fill the application form as instructed. Proceed further by attaching the scanned copies of required documents such as photographs, educational qualifications certificates, and proofs as asked and signature. Fill the AEEE Application Fee online (for convenience) to complete the process. Click on the option of submit and the application form is accepted. The exam for all the students whether they have submitted the applications online or offline will be conducted in only as per they have chosen in their application forms. But the students from across India except for Tamil Nadu and Karnataka can appear for the offline exams. Marking Scheme: For each correct answer, 03 marks will be added while for each wrong answer there will be the deduction of 01 mark. The students whose applications were accepted can book tier slots for the examination as per their convenience available for 3 different timings. However, the students giving offline examination will not have options. The syllabus for all students is crucial as they can study better as per the standards required for the exam. To ease the difficulty of students we have provided the detailed AEEE 2019 Syllabus topic wise. The topics wise detailing of each subject would help each of the students to learn preference of the exam and thereby letting the students know what to study first. Learn the basics from NCERT as they will provide great help for admissions. Take the mock test to increase the speed for attempting questions fast without getting answers wrong. Take up short goals and establish them as first. Use the AEEE Previous Paper to understand the questioning scheme very well. The seekers willing to secure their admission in the institute can improve their preparation by participating in the AEEE Online Mock Tests. Here we are providing you variety of mock tests for best preparation of the AEEE Exam. The mock tests have been prepared by the experts using the reference from the previous papers and creating questions. For Appearing in the examination, the procedure of offline & online exam contenders is different. The slot booking is the form of admit card downloading for students giving examination online. Students can easily know the different dates of AEEE Slot Booking and downloading admit cards for P&P latest here. In fact, authentic navigation is also provided here. Once when the students are done with their slot selection, admit card plays the vital role for appearing in the exam. The AEEE Hall Ticket 2019 will update applicants with accepted time, venue and date for giving the online/offline exam. The Institute announces its results for both the Online and Offline examination at its website only. The announcement for the result of the exam taken in April can be checked earliest by all in the month of May. Also, the qualifiers can get counseling for their admission in the month of June. To know exact dates of AEEE Exam Results keep referring here. The announcements of the result will be done in the format of the rank list. Students having their name in the rank list will be able to participate in counseling. The counseling can be taken by students for college selection. The university has its 5 branches in Coimbatore, Amritapuri, Kochi, Bangalore & Mysuru. The counseling will be conducted on different dates for which students qualifying the exam have to register. The allotment of seats and college branch can be known to students only thereafter. Once the counseling is done, students can submit their admission fee is satisfied.